seconds the lead was again 10.
play to restore a 12-point lead and serve as the dagger. for sure, but let's get all geeky together and look at the numbers. TO, TO, TO, two missed FTs, miss FG, TO, TO, TO. in 22 possessions. Or, 0.136 points per possession. Ridiculous. quality, aggressive minutes. It's comforting when VCU can depend on Reddic and Graham–both players were 7-11 FG and 3-4 FT on the night–because everyone else can settle into a specific role. That's the number of different VCU players who made a steal last night. but that number sure feels like a big one. and the team is 21-85 (24.7%) in the same time span. ***Briante Weber. I don't mean to weenie out, but re-read the What It Means section. understated kid. His basketball game is nothing of the sort. delivered. We mentioned last week the scowl that Brandenberg carries this year. The confidence to back that up continues to grow. Oh, and 14 points, six rebounds, three assists, and three steals is WAY more than a pedestrian stat line. overly excited, but that pump fake drive into the lane for a smooth six-footer reminds me very much of Dom Jones. is 2-15 from three on the year. Some have been wide open bricks. But shots will come–all I know is he is a fun player to watch, and he's just eight games into his VCU career. 42 shots in 173 minutes. 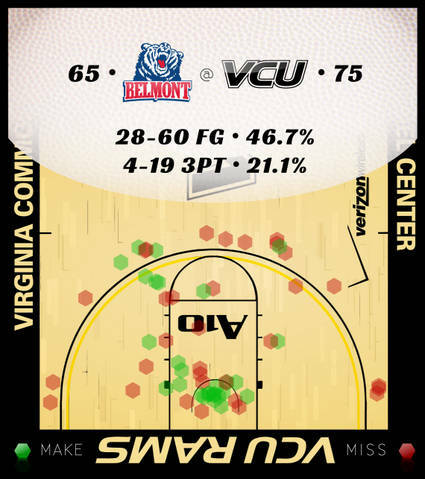 Finally, because the VCU Ramnation is awesome, here's a shot chart from last night's game, courtesy VCU fan Jeff Horne. This is great stuff, and we all benefit from his work. Personally, I love all the green (made shots) inside the paint.